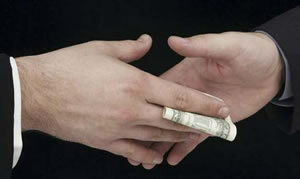 Why is the government delaying the Bribery Act? One of the last acts of the Labour government was to pass the Bribery Act 2010, which should enable courts to respond more effectively to bribery both at home but also abroad. It was passed with support from all parties, who acknowledged the UK needed to meet its international obligations, particularly under the OECD Anti-Bribery Convention. Given that the cost of corruption in Africa alone has been estimated at US $148 billion a year, representing 25% of the continent’s GDP, the Act contains important measures to put an end to companies actively fuelling corruption by paying bribes to foreign officials, a practice that undermines development and results in money being wasted. “…let me be clear: this government has a zero tolerance approach to corruption. Fast forward a few months and that 100 per cent support has evaporated at the first sign of resistance from business lobby groups, with the government dragging its feet in implementing legislation that would fulfil the UK’s international commitments and requirements. On Monday, officials at the Ministry of Justice confirmed that the Act would be delayed beyond the anticipated April 2011 deadline. The official reason given is that the Business Guidance has not been completed, and that business needs three months to make the necessary changes ahead of them being implemented. No new concrete date has been set for implementation of the Bribery Act, and there is concern that it may be indefinitely delayed or ‘watered-down’ by vested interests, resulting in nothing more than a tick-box exercise for companies. Could AV mean a fairer deal for the world’s poor?